There’s obviously a huge amount of interest in Tiger Woods at the Masters, especially when he’s not far from the lead; as writer Melanie Hauser noted in our oral history of Masters media coverage, “Nobody drives the ratings like Tiger. He doesn’t move the needle, he is the needle.” That’s true on the course too, where there are a lot of people following Woods, and that perhaps led to an almost-calamitous result after one of his shots Friday. Fortunately, Woods seemed to recover afterwards, and he drained the putt for birdie. That gave him his second remarkable birdie in two days on that hole. Hopefully, there won’t be any further ongoing effects from this, and hopefully security will be a little more careful going forward. 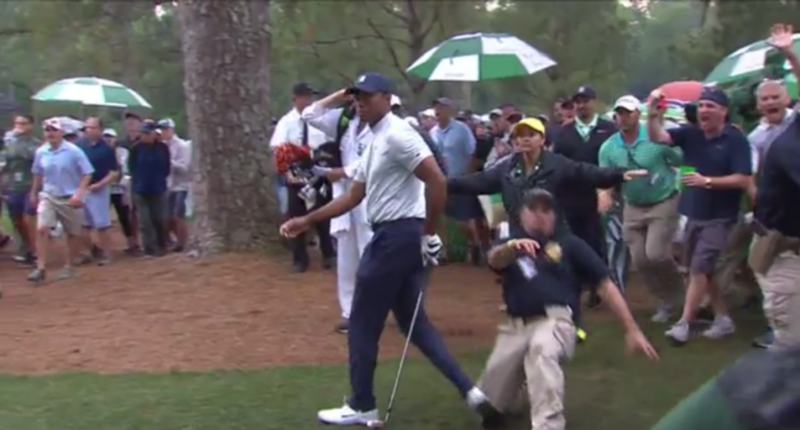 “Tiger Woods withdraws from Masters after security guard runs into him” would be a horrible headline.